Unicorn Press (UK), 9780877758006, 62pp. "Within every tornado of consequence is a core of quiet. Charlotte Matthews crouches inside that core. Each line break is an act of disclosure, a tilt toward devastation or delight. 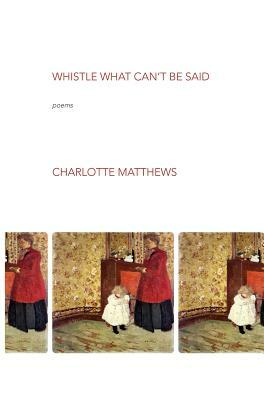 WHISTLE WHAT CAN'T BE SAID explores an experience with cancer, recognizing 'What I want back are not my breasts / though they were the exact ones I would / have chosen.' But Matthews offers much more than a recovery narrative. Spanning generations, each poem tugs at the senses with its careful phrasing; even dull linoleum comes alive with 'exquisitely bright flecks / the yellow of Audubon's Oriole.' Vibrant, wise, this collection awakened my awareness to the world." --Sandra Beasley.